Contact management software is essential if you are a business owner. It allows you to organize your business contacts and access them more efficiently than you did in the days where unique business cards were actually used. This is usually included as a feature in CRM software, which in addition offers a host of other features that are beneficial to businesses. If you are a business owner, you are probably looking to find the best contact manager out there. Here are the best contact managers for business owners, like yourself. Plaxo is a cloud-based contact management solution. This browser-based contact manager app is perfect for those who need access no matter where they are. Business owners are usually those type of people. You are often out of the office working with your employees on a segmentation analysis or other important operations management tasks. If you want to be able to access your contact manager software from the nearest device at any time, consider Plaxo. Salesforce is the most commonly used CRM software on the market. It has an incredibly wide range of features including task and event tracking, workflow business automation, data storage and custom app development. Access to these features will depend on the bundle you choose. Prices are typically on the higher end for Salesforce products. If you are only in need of a contact manager, you can choose the most basic plan for $5. If you would like the full suite of features however, you will need to pay a $300 monthly subscription fee. Salesforce is the best contact manager for you if you need a program that can manage almost every facet of business. Just make sure you are able to afford it. Zoho is a more affordable Salesforce.com competitor. It has a suite of programs with a lot of the same features. The basic bundle, which is the one that includes contact management, starts at no cost. You can buy premium bundles with more features like integration with Outlook, Quickbooks and Google Apps. However, none of these bundles are nearly as expensive as Salesforce’s prices. The top-tier Zoho plan is only $25. Zoho is the best contact manager for those who value pricing options. Pipedrive is a sales tool for entrepreneurs and small businesses, like mortgage brokers or real estate agents. This software is not just a contact management tool. It also offers features for forecasting deals along with providing Google Apps, MailChimp and Zapier integration. Pipdrive visualizes one sales pipeline, simplifying the process for everyone involved. In addition, the contact management software is intuitive and easy to use, even for those that are a bit tech inept. If you want a contact management tool that is great on-the-go and offers additional sales forecasting tools, consider Pipedrive. Google Contacts is an add-on to the Thunderbird email client and collaboration software. It does a fantastic job of integrating both your Gmail and Thunderbird contacts. Initial setup takes a bit of time to complete. The result, however, is great in that is transitions your Google contacts seamlessly into your Thunderbird address book. From there, you can add more information to your contacts. Google Contacts is free to use and easily accessible through Thunderbird’s add-on manager. 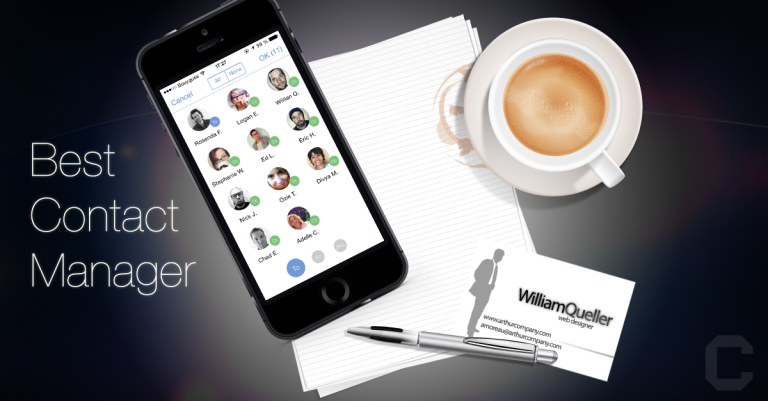 Its simplicity and ease of use make it the best contact manager for business owners who value those traits. Sage is another CRM program that offers contact management. The software provides contact information, contact history, archived notes and integration with social networking profiles. This makes it the perfect solution for travel agents, in particular. Sage’s interface is nicely divided to give you easy access to your business contacts. One of the main benefits of Sage is that it offers unlimited contact storage. Additionally, it allows you to sync with profiles from Facebook, Google Apps, LinkedIn and Outlook. Sage is frequently updated, so you will never have to worry about your software going out of date. Its versatile management features place it in the running for the best contact manager available. Contact management software vary in their pricing and range of features. Programs like Salesforce offer a myriad of features that can help organize almost every aspect of your business. It does however, come with a hefty price tag, which puts it just out of reach for social work business owners and other entrepreneurs with limited capital. Programs like Google Contacts, on the other hand, focus primarily on contact management. Google Contacts integrates with other software and is free to use. Evaluate the programs in this post and choose the best contact manager for your business needs.